At long last, the second chevron baby quilt is finished for my friend Kathy's other grandson. I delivered it this morning. I'm really loving these colors together, turquoise and gray. I incorporated a couple of the fabrics the mom had left over from decorating the baby's room and added a couple others to coordinate. Once again, I used Crazy Mom's tutorial. Quilted in an overall meander with Aurifil thread. There's a glimpse of the gray/white chevron print backing as well. The binding and a couple of the chevron rows are "Heath" by Alexander Henry in grey. So versatile, that stuff. Also in process is the scrappy16-patch quilt top. I made more blocks so it would be a comfortable size and am sewing them together now. Here are all the blocks laid out on the floor earlier this week. It's quite the riot, but I like it! 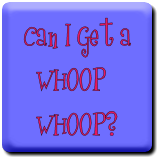 Linking to Whoop-Whoop Friday at Confessions of a Fabric Addict. Whoop whoop! Two great quilts there, P.! I like "Quite The Riot" for the name of the second one, too! These are fabulous! I was just trying to remember where the chevron tute was that I liked so- quilt mom, thanks! The turquoise and grey does look very nice together. You had nice light for your photo shoot, too! That chevron quilt is super sweet! Love the turquoise and grey. And the backing is perfect. Nicely done! The Chevron quilt is awesome! I just love those colours and the quilting is perfect. This is going to get a lot of love. The 16 patch is an eye catcher for sure. Just my type of quilt. I love it! You know, I was rather dubious about the white, grey, turquoise color scheme, but that quilt is just so fresh and pretty. Well done! Love the riot of color in the 16 patch. In fact that's what I'd name it! What size are the blocks? I like that you tell us about the fabrics and thread!